I have been out of town, so I've not been able to get too far into Mother & Son: The Respect Effect. I'm only a few chapters in, but I'm really learning a lot. I recognized that I see my son more through the love grid than the respect grid. That needs to change! Since he is the only child at home, now that my daughter is married and on her own, this is something I'm excited to learn more about to apply to my relationship with David. This book will be such a blessing for our family. It's true: sons and daughters equally need love and respect. But research has shown that the felt need during stress and conflict differs among males and females. Males filter their world more through the respect grid. If you are a mother with a son, this book is for you! 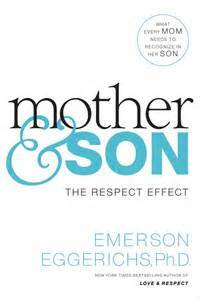 Just as Emerson Eggerichs, PhD, transformed millions of marital relationships with a biblical understanding of love and respect, he now turns these principles to one of the most important relationships of all: one between a mother and her son. Mother & Son shows how to use Respect-Talk and presents the testimonies of mothers who have tried it. Emerson provides a game plan so you not only see the man in the boy, but also recognize his innate desires for conquest, hierarchy, authority, insight, relationship, and sexuality. This book is about a mother going beyond her love and applying respect to the heart of her son. It is easy to relate to the need of all of us to feel a mother's love, but is that the same thing as our need for respect? Based on the insight that a mother's love is important, but respect is the key to her son's heart, this book will teach what every mom needs to know, what every son needs to hear. We all realize that little girls need their daddies' love, but no one is promoting the truth that little boys (and adult ones) need their moms' respect. No wonder mothers feel left in the dark on this topic. What makes this issue all the more urgent is that moms are coaching fathers to love their daughters, but no one has coached moms on specific ways to show respect to their sons, at least not in a way that is applicable and fully explained! Even for young boys, the Respect Effect is nothing short of astounding when applied properly. I have one copy of this fantastic book to give away! It's easy to enter through the rafflecopter widget below. Good luck! I'm a mom of boys, I think this would be a good read. I think this sounds like an interesting book that mothers of sons should read. I would like to read this book because I think it would give me insight into the boys and even my husband. I am interested in reading this book to help improve my relationships with my boys. I have an infant son but think this would benefit me greatly for the future!